I was talking with a fountain pen friend the other day when we discovered that we both, at different times, have gotten into Marie Kondo’s organizational book The Life-Changing Magic of Tidying Up. We both responded to Kondo’s concept that you should seek to be surrounded only by the objects that bring you joy. Coincidentally, I had just that morning been staring at a pen cup full of fountain pens, thinking, do I have too many Safaris? Ha, well, yes, of course. I had seven Safaris and Al-Stars inked in the pen cup at that moment. And that is but a fraction of the number I actually own. But I looked at them with only satisfaction: pink and reds and apple green and black and charcoal, and a Vista, right there, filled with ink. And I thought, they make me happy. So it’s perfect. 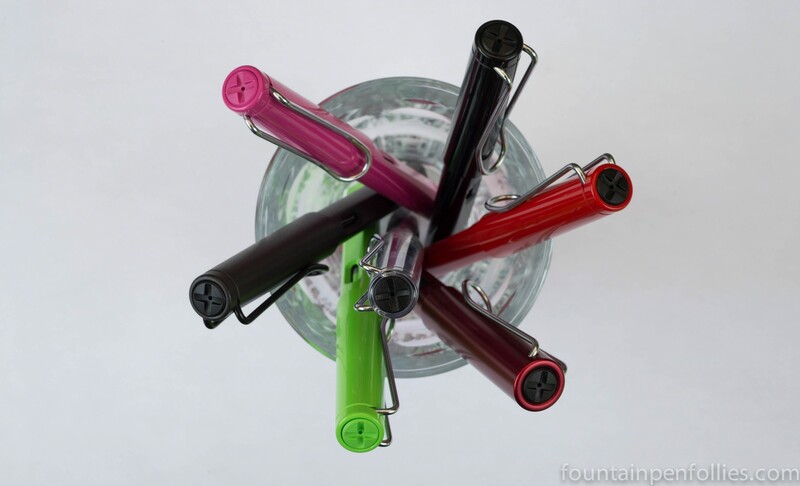 I stumbled upon your article on fountain pens, which I found to be delightful. Thank you for posting it. I was also intrigued by your reference to Kon Marie and her approach to owning items. I have always had a natural inclination to clean but her point on sparking joy helped me push that little bit further and remove what is essentially unecessary junk which is only stifling. My challenge now lies with fountain pens. I have arbitrarily set myself a limit of 6 quality pens that really spark joy. In the process I have also settled on one brand ‘Montblanc’, not because I am ‘brand’ person but the first and subsequent ones I have bought just work perfectly from the start, unlike many other lauded pens which I have bought and subsequently disposed off. Anyway, the limit of six helps me deal with ‘boy in a sweet shop’ syndrome which I experience frequently when read pen blogs online, or passing shops. It also appeals to my innate ‘Kon mari’ approach because if I get too many i start to feel the clutter sensation. I have not reached my six (4 to date) but my arbitrary limit helps me make very careful choices and ensures the new pen ‘really sparks joy’. Thank you so much, Nigel. That is really inspiring to me I would love to be able to limit myself to six fountain pens, or even just six outside the ones with sentimental value. I’m not there yet. I am also a Montblanc pen fan for the same reason. In fact, I decided that if I ever wanted to keep only one fountain pen, it would be my LeGrand with extra-fine nib. Solid, reliable and just a great tool. Thanks for responding Laura and good luck with setting a limit. It’s a challenge! But she has some great insights. She focuses on your feelings about your objects and your living space in a way that I found insightful and very helpful. An eloquent explanation of the heart of fountain pen use. If we merely wanted a tool for communication, we could be paper less and send everything electronically. But we don’t. We connect with the pen as it lays ink upon the paperWe seek a deeper experience than simply conveying words. I, too, have discovered the joy of having fewer pens loved well — though my “fewer” is someone else’s abundance. Kondo calls that sweet spot of “just enough” your “click point,” and the only way to find it is to listen to what your own heart says as you handle each one.